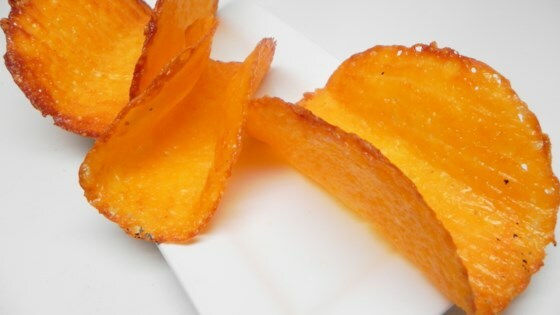 "Try these cheese taco shells made from baked Cheddar cheese and shaped into a taco; these are a great gluten-free, low-carb, and keto option." Preheat oven to 400 degrees F (200 degrees C). Line 2 baking sheets with parchment paper or silicone mats. Wrap the handle of a wooden spoon with aluminum foil. Balance between 2 tall cans. Spread Cheddar cheese on the prepared baking sheets into four 6-inch circles placed 2 inches apart. Bake in the preheated oven until cheese melts and is lightly brown, 6 to 8 minutes. Cool for 2 to 3 minutes. Lift with a spatula and drape over the wrapped wooden handle; cool until set, about 10 minutes. I made the recipe as is.... but also made some with lactose free cheese. It was yummy! Oh my goodness. A healthy alternative for taco night! I had no problem making these and allowed my imagination to take over when arranging these to cool. HA!